Vitebsk, or Viciebsk (Belarusian: Ві́цебск, Łacinka: Viciebsk, pronounced [ˈvʲitsʲepsk]; Russian: Витебск, pronounced [ˈvʲitʲɪpsk]), is a city in Belarus. The capital of the Viciebsk Region, it had 342,381 inhabitants in 2004, making it the country's fourth-largest city. It is served by Viciebsk Vostochny Airport and Viciebsk Air Base. Viciebsk developed from a river harbor where the Vićba River (Віцьба, from which it derives its name) flows into the larger Western Dvina, which is spanned in the city by the Kirov Bridge. Archaeological research indicates that Baltic tribes had settlements at the mouth of Vitba. In the 9th century, Slavic settlements of the tribal union of the Krivichs replaced them. According to the Chronicle of Michael Brigandine (1760), Princess Olga of Kiev founded Viciebsk (also recorded as Dbesk, Vidbesk, Videbsk, Vitepesk, or Vitbesk) in 974. Other versions give 947 or 914. Academician Boris Rybakov and historian Leonid Alekseyev have come to the conclusion, based on the chronicles, that Princess Olga of Kiev could have established Viciebsk in 947. Leonid Alekseyev suggested that the chroniclers, when transferring the date from the account of the Byzantine era (since the creation of the world) to a new era, obtained the year 947, later mistakenly written in copying manuscripts as 974. An important place on trade route from the Varangians to the Greeks, Viciebsk became by the end of the 12th century a center of trade and commerce, and the center of an independent principality, following Polotsk, and at times, Smolensk and Kiev princes. The official year of the founding of Viciebsk is 974, based on an anachronistic legend of founding by Olga of Kiev, but the first mention in historical records dates from 1021, when Yaroslav the Wise of Kiev gave it to Bryachislav Izyaslavich, Prince of Polotsk. In the 12th and 13th centuries Viciebsk functioned as the capital of the Principality of Viciebsk, an appanage principality which thrived at the crossroads of the river routes between the Baltic and Black seas. In 1320 the city was incorporated into the Grand Duchy of Lithuania as dowry of the Princess Maria, the first wife of Grand Duke of Lithuania Algirdas. By 1351 the city had erected a stone Upper and Lower Castle, the prince's palace. In 1410 Viciebsk participated in the Battle of Grunwald. In 1597 the townsfolk of Viciebsk were privileged with Magdeburg rights. However, the rights were taken away in 1623 after the citizens revolted against the imposed Union of Brest and killed Archbishop Josaphat Kuntsevych of Polotsk. The city was almost completely destroyed in 1708, during the Great Northern War. In the First Partition of Poland in 1772, the Russian Empire annexed Viciebsk. Under the Russian Empire the historic centre of Viciebsk was rebuilt in the Neoclassical style. Before World War II Viciebsk had a significant Jewish population: according to Russian census of 1897, out of the total population of 65,900, Jews constituted 34,400 (around 52% percent). The most famous of its Jewish natives was the painter Marc Chagall (1887-1985). In 1919 Viciebsk was proclaimed to be part of the Socialist Soviet Republic of Byelorussia (January to February 1919), but was soon transferred to the Russian Soviet Federative Socialist Republic and later to the short-lived Lithuanian–Byelorussian Soviet Socialist Republic (February to July 1919). In 1924 it was returned to the Byelorussian Soviet Socialist Republic. During World War II the city came under Nazi German occupation (10 July 1941 – 26 June 1944). Much of the old city was destroyed in the ensuing battles between the Germans and Red Army soldiers. Most of the local Jews perished in the Viciebsk Ghetto massacre of October 1941. In the first postwar five-year period the city was rebuilt. Its industrial complex covered machinery, light industry, and machine tools. In January 1991 Viciebsk celebrated the first Marc Chagall Festival. In June 1992, a monument to Chagall was erected on his native Pokrovskaja Street and a memorial inscription was placed on the wall of his house. Since 1992 Viciebsk has been hosting the annual Slavianski Bazaar in Viciebsk, an international art festival. The main participants are artists from Russia, Belarus and Ukraine, with guests from many other countries, both Slavic and non-Slavic. In 1999 a free economic zone "Viciebsk" was established. The city built the Ice Sports Palace, and there was a remarkable improvement and expansion in the city. The central stadium was reconstructed and the Summer Amphitheatre for the international art festival, the Slavic Bazaar, the railway station and other historical sites and facilities were restored, and a number of new churches and other public facilities were built, together with the construction of new residential areas. The city has one of the oldest buildings in the country: the Annunciation Church. This magnificent six-pillared building dates back to the period of Kievan Rus since the city at the time was pagan and didn't belong to the Ukrainian Orthodox Church or the Russian Orthodox Church or the Kievan Rus state. It was constructed in the 1140s as a pagan church, rebuilt in the 14th and 17th centuries as Roman Catholic Church, repaired in 1883 and destroyed by the Communist administration in 1961. The church was in ruins until 1992, when it was restored to its presumed original appearance. Viciebsk is also home to a lattice steel TV tower carrying a horizontal cross on which the antenna mast is guyed. This tower, which is nearly identical to that at Grodno, but a few metres shorter (245 metres in Viciebsk versus 254 metres at Grodno) was completed in 1983. The city is also home to the Marc Chagall Museum and the Viciebsk regional museum. Viciebsk has warm summer humid continental climate, Köppen: Dfb. Summers are generally warm, while winters are relatively cold but still warmer than in Moscow. Approximately 724 mm of precipitation falls here per annum. The main universities of Viciebsk are Viciebsk State Technological University, Viciebsk State Medical University and Viciebsk State University named in honor of Pyotr Masherov. The website of the city of Viciebsk www.gorod212.by, a news portal. 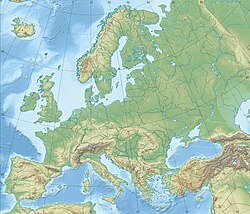 ^ "Belarus - The regions of the Republic of Belarus as well as all cities and urban settlements of more than 10,000 inhabitants". City Population. Retrieved 17 August 2015. ^ "Weather and Climate- The Climate of Vitebsk" (in Russian). Weather and Climate (Погода и климат). Retrieved 28 November 2015. ^ "Сайт города Витебска - gorod212.by". www.gorod212.by. Retrieved 2016-04-13. 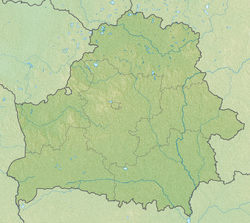 Wikimedia Commons has media related to Vitebsk. 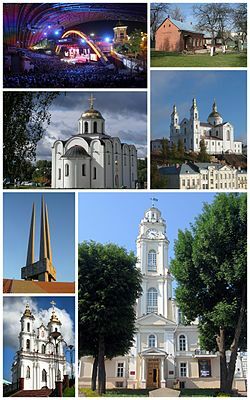 Wikivoyage has a travel guide for Vitebsk.